Our mission is to be THE Go To Resource for all things of mind, body, and spirit. Natural healing is becoming more widely acceptable by both consumers and the medical field. 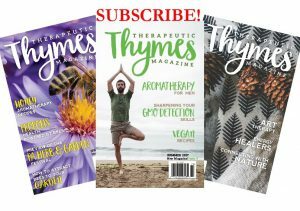 This quarterly magazine, complemented by its website and social media, covers herbal remedies, natural & holistic healing, herbs & gardening, aromatherapy, essential oils, reiki, yoga, crystals, and natural living, as well as other relevant subjects. Annual subscription … just $15. Single Issue … $5.25 (tax included). Subscribing is cheaper for you, more convenient, and better for the environment. A single copy is $4.95. A subscription – which is four issues – is just $15. That’s like getting an issue free! Plus, it will conveniently be delivered directly to you at no extra charge. The planet will thank you as well. The big name store chains that carry magazines do not return them to the publisher. Instead those unsold copies end up usually in landfills. Your subscription ensures that does not happen. (c) 2019. Therapeutic Thymes. All Rights Reserved.